It’s a great question. And I applaud my friend for having the courage to ask it. Because I know a lot of folks are confronting the same dilemma, yet they might be unwilling to admit it. PTNS – Post Traumatic No Syndrome! It attacks in four stages. Stage 1: What you say to the decision-maker. Stage 2: What you say to yourself. Stage 3: How you really feel. Stage 4: What you really think. So how do you combat PTNS? Here’s how. Sulk. Pout. Whine. Complain. Scream. Yell. Stomp. Pound. Turn despair into desire. Loss into learning. The “No” into knowledge. How you positioned or inquired about future opportunities? How you earned the right to still ask for referrals and how many you received? It’s unfortunate they won’t benefit from my expertise and talent. 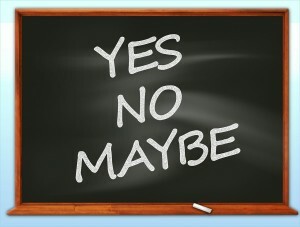 This “No” gets me closer to a “Yes” with another decision-maker. Before you decide how you’ll combat an objection, determine how you’ll first combat yourself. For example, if you’re repeatedly getting pre-mature price objections, discover why. Perhaps you’re too quick to give an information and feature-dump before effectively probing. Or you mistakenly keep stressing you’re less than your competitors, which draws attention to price, not value. Here, an objection is likely to be the “result” of your wrong behavior. Sorry, but it’s likely you’re the “reason” for the objection, not your buyer. Therefore, let’s focus on the right behavior, when an objection pops up. You can always try to combat objections or obstacles with facts, logic, data, surveys and stats. These help. They’re a great place to start. However, you better also appeal to the decision-maker’s “perceived reality.” Meaning, what their gut tells them is the perceived issue or concern. Hey, I’ll never downplay the significance of facts and logic. They’re invaluable. Yet they don’t always lead to a sale. With “persuasive emotion” you creatively focus on the buyer’s inner feelings, concerns, needs and motivators. Mo Jo is a special blend of power, energy, force and momentum. It does more than merely adeptly deflect an objection or obstacle. It also conveys with clarity and conviction, your unequivocal desire to help your decision maker make the right choice and do the right thing. It’s about the pursuit of your customer’s goals, before the pursuit of your profit. It’s about gaining the customer’s commitment, not just their cash. It’s about long-term results, not short-term conquests. You must create an environment with your responses, so your decision-makers know they can rely upon and trust you. The mind of the buyer can be a complex combination of fear, concern and hesitation. Your job is to bust through this complexity, with articulate, risk-reducing replies. You provide the types of answers that demonstrate both good business sense and intuitive emotional understanding. Then, you turn obstacles into opportunities. This entry was posted in Results for Life and Business by Jeff Blackman. Bookmark the permalink.